Yesterday when I was writing about 80 years of ” ALAM ARA “ , first Hindi talkie , rather Indian talkie , I came across an article in Screen which states that B. N. Sircar’s legendary film production company ” New Theatres “ also completed 80 years on February 10 , 1931 . It was one month and four days before the epoch making ” ALAM ARA “ , that this legendary production company was launched . 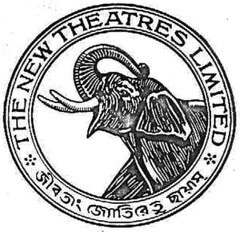 ” New Theatres “ , Calcutta [ now Kolkata ] was founded by producer B. N. Sircar a.k.a. Birendranath Sircar, the recipient of Dadasaheb Phalke Award of 1970. 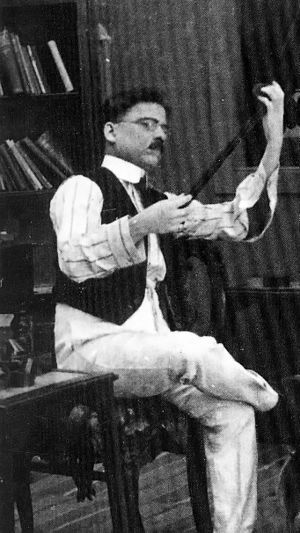 Like Ardeshir Irani’s Imperial Movietone , New Theatres of Calautta [ now Kolkata ] produced ” Dena Paona ” , the first Bengali talkie. It was released in 1931, and was directed by Premankur Atarthi . Famous musician Raichand Boral composed music for this movie. After first Bangla talkie, ” Dena Paona “ , ” New Theatres ” produced another path breaking film ” Devdas “ in 1935. P.C. Barua directed and acted in ” Devdas “ , based on Saratchandra Chatterjee‘s novel ” Devdas “ and this film became phenomenally successful in the industry. 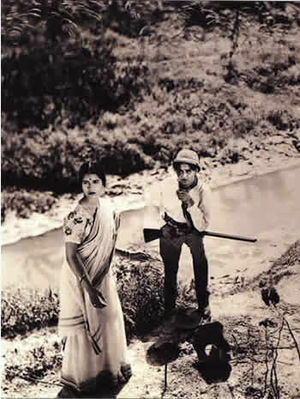 Pramathesh Barua and Jamuna Barua in Debdas, 1935. 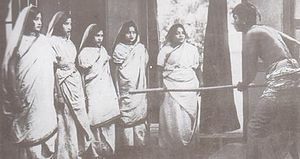 In 1935, playback singing was first used in India in the New Theartes production Bengali film ” Bhagya Chakra ” by Nitin Bose. The singers were K C Dey, Parul Ghosh and Suprabha Sarkar. ” Dhoop Chhaon “ Hindi remake of this film, was the first Hindi film to use playback singing. It was another feather in New Theaters’ cap . 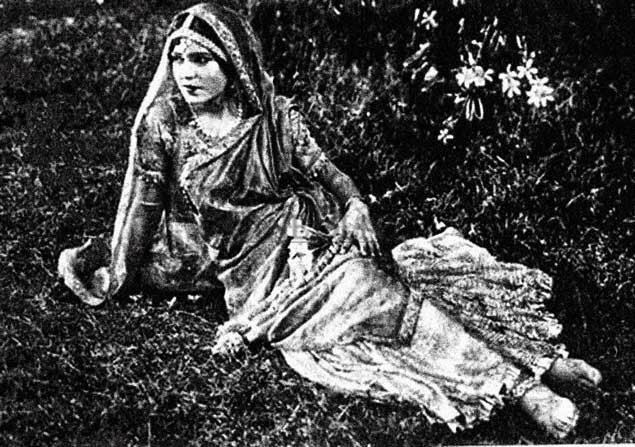 Kanan Devi was the first popular star actress, who appeared in many films produced by ” New Theatres “ . Also there was a group of talented actors with New Theatres like K.L. Saigal, K. C. Dey, Prithviraj Kapoor, Chhabi Biswas, Bikash Roy, Pahari Sanyal, Basanta Choudhury. Top directors like Premankur Atarthi, P.C. Barua, Debaki Bose and Nitin Bose worked in New Theatres films. The Famous musicians who worked there include R. C. Boral, Pankaj Mullick and Timir Baran. Of the above mentioned films , I have seen two classics ; Pramathesh Barua directed ” Mukti “ [ 1937 ] and ” Devdas” . Bimal Roy directed ” Udayer Pathe “ [ 1944 ] was later made in Hindi as ” Naya Zamana ” starring Dharmendra and Hema Malini. I have seen the Hindi version. Among all the illustrious directors , who worked in ” New Theatres ” , I was fortunate enough to meet Phani Majumdar and was able to take his blessings. Phani da made his debut with ” Street Singer “ , a Kundan Lal Sehgal starrer. It had famous Sehgal song – BABUL MORA NAIHAR CHHUTO HI JAY . Later on he directed successful films like ” Aarti “ [ first film of Rajshri banner ] , ” Akashdeep ” and ” Oonche Log ” . I was fortunate enough to meet his actress wife Monice Desai also. Phani da died in 1994, when I was starting my acting training career. After 55 years ” New Theatres ” , the legendary banner , is again producing a new film. On March 14 , 1931 Indian cinema created history . 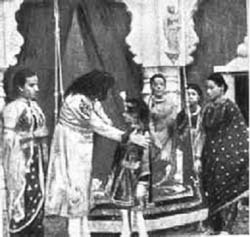 First Hindi talkie ” ALAM ARA “ made by Ardeshir Irani was released on this very day in the Majestic cinema of Bombay [ now Mumbai ] Though , ” RAJA HARISCHANDRA ” , first ever full – length silent feature film of India was made by Dada Saheb Phalke , the pioneer of Indian cinema , in 1913. 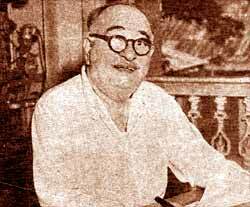 It took almost 18 years to produce a talkie film and Ardeshir Irani became the pioneer. ” ALAM ARA ” made under the banner of Imperial Movietone had Master Vithal and Zubeida as the leading stars of the film and the movie had 7 memorable songs including DE DE KHUDA KE NAAM PAR sung by Wazir Mohammad Khan , who also played a faqir in the film . 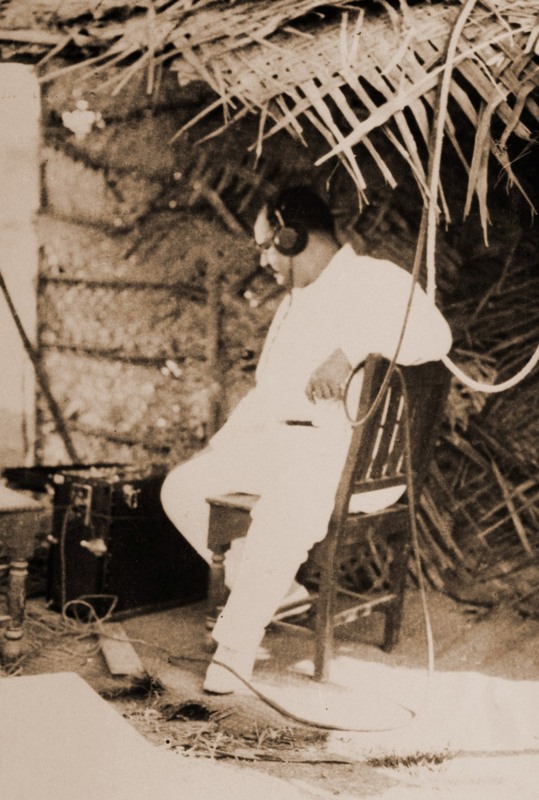 In those early years of talkie era there were no system of recording the song , Ardeshir Irani recorded it live with harmonium and tabla . This particular song is considered as the first ever song of not only Hindi films but Indian films as well. 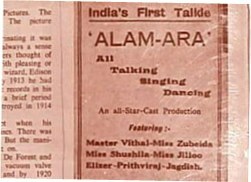 Music of ” ALAM ARA “ was given by Ferozshah M. Mistri and B. Irani .When released in the Majestic cinema hall of Bombay [ now Mumbai ] it created history . Public frenzy was to be seen to be believed , and finally police had to be summoned to control the crowd . The film is a love story between a prince and a gypsy girl, based on a Parsi play written by Joseph David. 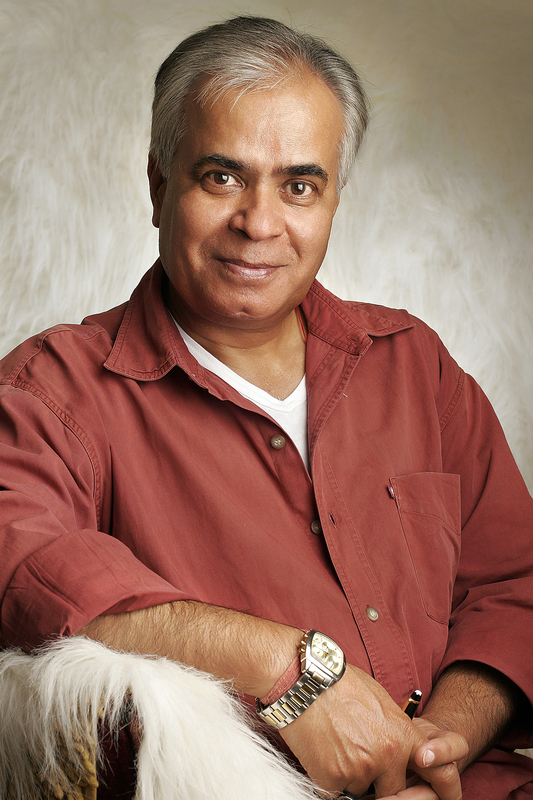 David later served as a writer at Irani’s film company. The story centers on an imaginary, historical royal family in the kingdom of Kumarpur. 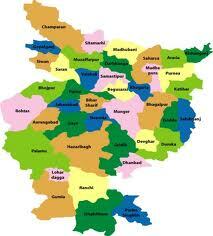 The main characters are the king and his two warring wives Dilbahar and Navbahar. 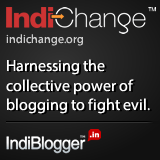 Their rivalry escalates when a fakir predicts that Navbahar will bear the king’s heir. Dilbahar, in revenge, attempts to have an affair with the kingdom’s chief minister Adil. The affair goes sour and a vengeful Dilbahar imprisons him and exiles his daughter, Alam Ara (Zubeida). 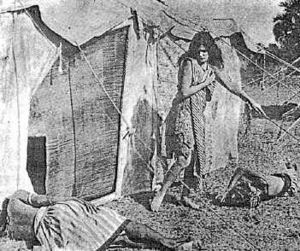 In exile, Alam Ara is brought up by Gypsies. Upon returning to the palace at Kumarpur, Alam Ara meets and falls in love with the charming young prince (Master Vithal). In the end, Adil is released, Dilbahar is punished and the lovers marry. 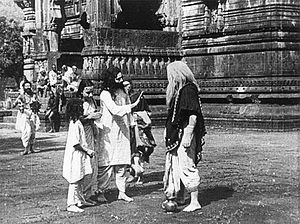 After the fire at National Film Archive of India, Pune, in 2003, which destroyed the last surviving prints of several classics such as Raja Harishchandra and Achhut Kanya, this film is no longer available in its original format. The name of the actors , who played major role in ” ALAM ARA ” , is worthy of notice for the today’s film connoisseurs. Apart from Master Vithal and Zubeida Begum Dhanrajgir [ known as Zubeida ] , it had singer Wazir Mohammad Khan as a faqir. Three prominent actors , who were part of the cast of ” ALAM ARA ” and who played major role in the talkie era and are known to today’s generation also , were Prithvi Raj Kapoor , Jillo Bai and L. V. Prasad . Prithvi Raj Kapoor went on to play major roles in many films , won many awards and created an empire. His legacy was carried forward by his sons ; Raj Kapoor, Shammi Kapoor and Shashi Kpoor. Later on legacy was carried forward by his grandsons ; Randhir Kapoor, Rishi Kapoor and Rajeev Kapoor. Now fourth generation of Prithvi Raj Kapoor’s family is working in films. They are Kareena Kapoor and Ranbir Kapoor. Shashi Kapoor’s daughter manages Prithvi Theatre , made to commemorate Prithvi Raj Kapoor’s memory. Jillo Bai was seen as Madhubala’s mother in ” Mughal – E – Azam “ and as mother – in law of Nargis in ” Mother India “ . Case of L. V. Prasad is more curious. He worked as an actor in first Hindi talkie ” ALAM ARA ” , first Tamil talkie ” KALIDAS ” and first Telugu talkie ” BHAKT PRAHLAD ” , all released in 1931. Later on he stablished a major production company named as Prasad Productions and made hits like ; ” SHARDA ” , ” CHHOTI BAHAN ” , ” BETI BETE ” , ” DADI MAA ” , ” MILAN ” , ” JEENE KI RAH ” , ” RAJA AUR RANK ” , ” KHILONA ” and ” EK DUJE KE LIYE ” . It is sad that no print of the epic movie ” ALAM ARA “ is available today. This part of our history is lost for ever and no one is bothered . Ardeshir Irani’s path-breaking film is lost forever. Ardeshir Irani died in 1969 , when I was studying in intermediate and Zubeida Begum Dhanrajgir a.k.a. Zubeida died in 1988, one year before I came to Mumbai to make a career in films.